Coalescing plate separators from Baldwin Industrial Systems are enhanced gravity separators designed to effectively remove oils and greases, as well as suspended solids from wastewater streams. The coalescing plate separators employ a simple and straightforward technology, with no moving parts involved in the separation process. Baldwin’s white paper on ‘The Theory behind Coalescing Plate Separators’ explains that a law of physics is the basis behind the successful operation of coalescing plate separators in applications such as mining workshops, mining wash bays, petroleum refineries, service stations, petroleum depots, power stations, oil and gas stormwater treatment, tank farms, bund water treatment, railway workshops, railway wash bays and mechanical workshops. Installed as above ground tanks or in-ground pits depending on the application site, coalescing plate separators are a scalable treatment system that can be as large as the water flow rate and effluent discharge quality demand. Baldwin can supply coalescing plate separators for flow rates from 1,000 litres per hour to over 500,000 litres per hour with the discharge quality depending on a number of factors and designed to meet sewer admission limits or stormwater limits depending on the specific situation on site. 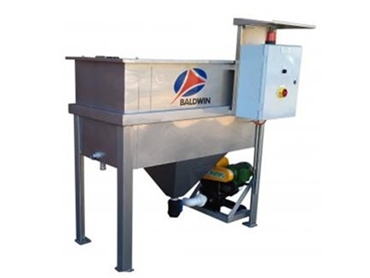 Equipment and options available with Baldwin coalescing plate separators can include feed pumps; control panels – from Form 1 to Form 3B MCC; floating suction skimmers and strainers; polishing media; skid mounting; pre-plumbed – stainless steel or pressure PVC; pre-cabled; factory acceptance tested; waste oil tanks; and access platforms. Key features of Baldwin coalescing plate separators include tough and compact construction, modular plate packs, specific design to prevent blocking, various sizes and configurations, approved by most Australian authorities, first flush, storm by-pass configurations available, and complete package systems, including pumps, level controls and low voltage panels available for all applications. Benefits of Baldwin enhanced gravity separators include no moving parts for minimum maintenance, gravity or pumped flow – basic unit or auto system, sludge dewatering options, chemical resistant stainless, polyethylene and polypropylene components, performance guarantees available, easy and quick installation, and effluent qualities to less than 10ppm.